In his first two years as an NFL coach, Chip Kelly was a whirlwind of change, challenging the conventional wisdom on everything from players’ food to game tempo to the team schedule (giving his team Monday off after Sunday games instead of the usual Tuesday). And while Kelly’s “college boy” style was mocked at first, much of the NFL has been following his lead. Sports Science is spreading through the NFL (the Cowboys just bought a virtual reality training system), his last two QB coaches have been hired as offensive coordinators by Miami and Oakland, Denver is teaching Peyton Manning the read-option, and even Bruce Arians is adopting the no-huddle. Some of this was common sense — the Eagles were a very talented team despite their 4-12 record in Reid’s last year, so why discard everybody? Some of it, I think, was wise caution. He knew he was making a big leap into the big leagues, which is why he hired two coordinators with long NFL careers and stayed relatively traditional in his schemes and formations. It takes a while to adjust and feel out how the new competition works. At Oregon, Kelly had two years as offensive coordinator to get his bearings before he took over as coach. It looks like 2013-4 were his equivalent in the NFL. Now Kelly is making his move, and none too soon. 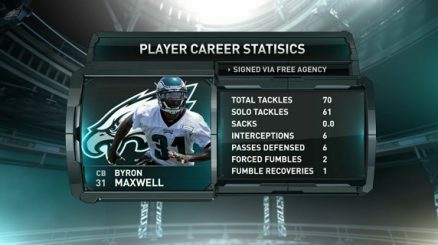 He’s almost halfway through his five year contract, and Philadelphia is not a patient city. Fans have waited 54 years since the city’s last NFL championship, and owner Jeffrey Lurie has given Kelly everything he wants: money, staff and full control over player personnel. There are no excuses left. Aside from quarterback, a position that every team has trouble filling, there are no major holes left on this team. Kelly saw to that by acquiring Kiko Alonso at inside linebacker and six DB’s (along with a new DB coach) this off-season. Some of Kelly’s caution was the result of those holes in the defense. 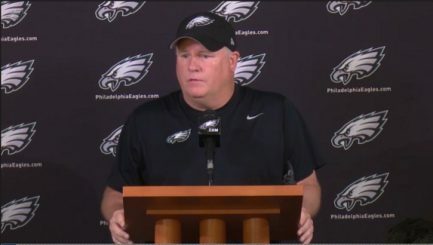 When asked about going for it on fourth down at Oregon, he usually said something like “We were confident that our defense could hold them if we didn’t make it.” Given the Eagles’ vulnerability to long passes and on third-and-long plays the past two years, no reasonable observer could have had that confidence. The front line remains rock solid. Once Cory Undlin solidifies this secondary, I expect that Kelly will be much more aggressive in his offense as well. The Eagles are still in OTA’s, with players wearing shorts and avoiding contact, but the rough shape of this team is starting to emerge. Free agent slot cornerback Walter Thurmond has moved to safety, and appears to be the front runner to start alongside Malcolm Jenkins, even though he has never played safety before. Kelly expressed pretty naked impatience with 3rd year safety Earl Wolff‘s return from “mini-micro-fracture surgery” last year, noting that the team doctor had cleared Wolff to play weeks ago. Nolan Carroll, who replaced Bradley Fletcher last year starting with the fourth quarter of game 15, is competing with second round pick Eric Rowe and slot CB Brandon Boykin for the starting outside CB job opposite Byron Maxwell, and Carroll has the initial edge. Carroll’s hybrid linebacker/DB role in the team’s Dime package last year will likely be filled by Alonso, who has great ball-hawking skills. Swing linebackers Travis Long and Marcus Smith II are competing to back up Brandon Graham and Connor Barwin at OLB, although Smith has been hobbled with soft-tissue injuries. The big news this week was Kelly releasing dissatisfied Pro Bowl offensive guard Evan Mathis. This is especially sad for sportswriters because Mathis is hilarious and very active on Twitter and Reddit, as well as being an excellent zone-scheme guard. On the other hand, he was already the NFL’s eighth-highest-paid starting guard and the oldest at 34, and he missed seven games with a knee injury. Mathis signed a five-year, $25.5 million contract in 2012 and had two years left. He wanted more money and the team gave his agent Drew Rosenhaus permission to try to find a trade deal, but he couldn’t find any team willing to bargain. Reportedly, last September the team had offered him $1 million more per year for his last two years, but he turned it down. 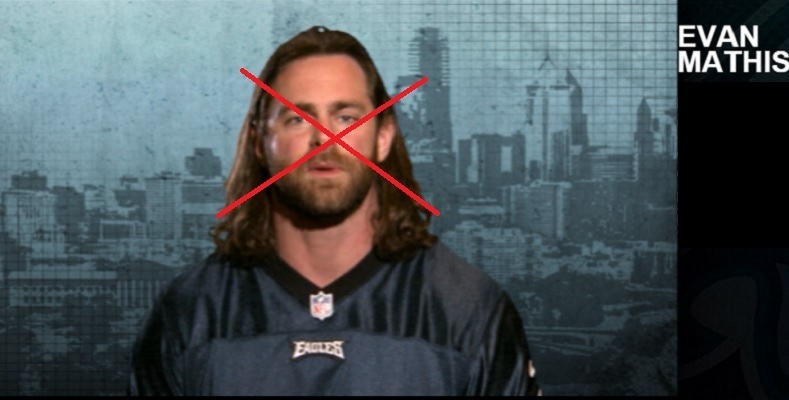 After Kelly replaced Howie Roseman as GM, Mathis changed his mind but Kelly had taken the offer off the table. Clearly, Kelly’s caution period is over. Of those players on Reid’s last roster, only eight are projected to start this year, and four of those are not for certain: Riley Cooper, Mychal Kendricks, DeMeco Ryans and Brent Celek. Releasing Mathis may be his biggest gamble of the off-season, if for no reason other than the fact that he got nothing in return. Hopefully no more players make the mistake of thinking Chip doesn’t mean what he says about culture. He said it trumps scheme. Believe him.